Collection container for transportation of different materials such as dirty linens, bio-hazard waste, and general waste disposal. Covers and bags available in different colors or use the bag of your choice. Ideal for transparent bags used for security in risk areas such as airports and transportation hubs. Eliminates bulk and weight; polymer wheels swivel silently for maximum manueverability. 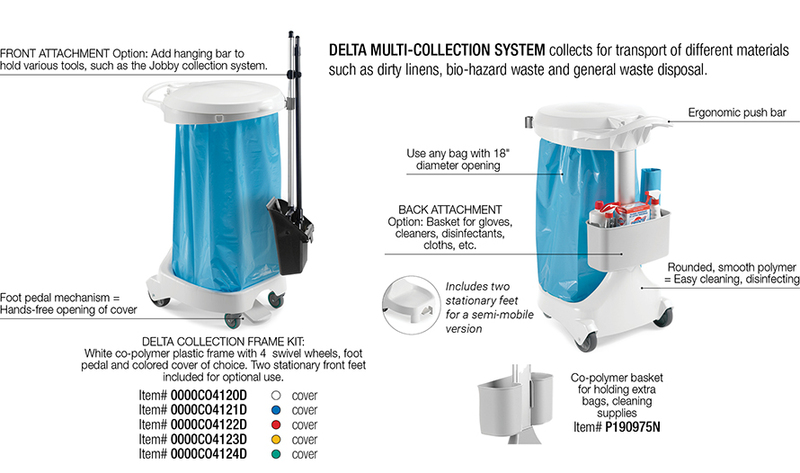 CONVERT TO CLEANING CART "LITE"
Attachments transform DELTA to an abbreviated mobile cleaning cart with general cleaning necessities.